AgroAtlas - Weeds - Amaranthus blitoides S. Wats. - Spreading pigweed. Amaranthus blitoides S. Wats. - Spreading pigweed. Family Amaranthaceae Juss., genus Amaranthus L.
Annual seed-propagated aestival-autumnal weed, segetal-ruderal. Stem is mostly prostrate, ramified from the base, albescent, hairless or with short hairs at the top, quite leafy, height 15-50 cm; leaves are obovate or spathulate, to lanceolate-oblong; with a thin thorn to 1 mm long at the top, tapered gradually into petiole toward the base, leaf margins have light border. Flowers are glomerated in axils; hypocotyls are lanceolate, shorter than perianths; perianth is tetramerous (sometimes there are flowers with a pentamerous perianth on the same plant); perianth leaflets of staminate flowers are lanceolate, shortly pointed, pestillate flowers have lanceolate-oblong perianth leaflets unequal in length, with a gristly bulge at the base; boll is rounded elliptic, shorter than the longest perianth leaflet (it is 2-2.5 mm long), opens across with a mostly redish cover; seed is 1.3-1.5 mm, rounded obovate, black, not very glossy. The mass of 1000 seeds is 0.5-0.6 g. The maximum fruitfulness of one plant is about 700,000 seeds. Seeds emerge from the depth not more than 8 cm and they maintain the ability to germinate in soil up to 40 years. Nearly cosmopolitan. Central and Northern America, South-Western Europe, the Mediterranean area. The south of the European part of the former USSR, Central Asia (plain parts). Xeromesophyte, do not stand floods. Found most frequently in steppe zones and very seldom in taiga zones. Shoots emerge at the minimal temperature +7-+8°C, with optimal temperature of +30 - +36°C. Infests crops, especially tilled crops, and others more rarely. Ruderal weed. Never infests rice. It is uncommon in grain crops. 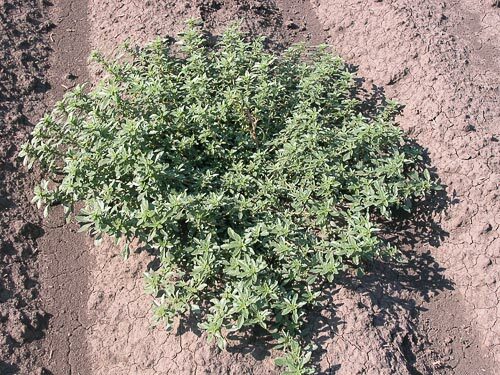 It is resistant in tilled and vegetable crops, especially irrigated ones. Control measures include stubbling, inter-row cultivation and chemical weeding. Nikitin V.V. 1983. Weed plants in the flora of the USSR. Leningrad: Nauka. 170 p.
Shishkin, B.K. 1936. Flora of the USSR. Moscow-Leningrad: Ac. Sc. USSR. V. 6: 363. Veselovskiy I.V., Lysenko A.K., Man'ko Yu.P. 1988. The atlas identification book on weeds. Kiev: Urozhay. 32 p.